Author: Stephen Evans | Project Engineer | s.evans@indectusa.com Parking Guidance Systems (PGS) have become popular among parking owners because of the customer service benefits they offer. Parking Guidance Systems (PGS) have become popular among parking owners because of the customer service benefits they offer. However, most owners don’t realize that PGS can also help owners with a number of essential management functions, including capital planning. Traditionally, one of the most difficult challenges facing owners, particularly owners with multiple parking facilities, has been getting an accurate understanding of how full their facilities are, and when they are most likely to be full. This is essential information for determining whether current supply is sufficient to meet demand, not to mention for planning whether the supply will meet anticipated future demand. In fact, it’s not unusual for owners to overestimate the occupancy of their parking facilities and make future expansion plans based on erroneous assumptions. It’s a problem that afflicts owners of all types, including municipalities, colleges, airports, private developers, and other private and institutional owners. All too often, owners make unnecessary capital investments because they think there’s a shortage of parking when there really isn’t. The financial implications of unnecessarily developing new parking can be disastrous. No parking owner can afford to invest hundreds of thousands—or even millions—of dollars in new garages or lots that aren’t needed. Historically, keeping track of occupancy rates has been a hit or miss proposition. The only way to keep track of how parking resources were being utilized was to manually count cars. Typically, a parking consultant would station an employee (or a few employees) at strategic locations in a city or in a particular facility, and count cars as they exit and enter. The problem with car counting is that it’s typically only done for a few days—or even just a few hours on certain days—and the resulting counts aren’t always accurate. It’s tough to manually keep track of which cars are arriving and leaving, particularly in large facilities. Historically, keeping track of occupancy rates has been a hit or miss proposition. Parking Guidance Systems can overcome these shortfalls because the equipment is always recording occupancy in real time. The system always knows which spaces are occupied, and how many are free. With the click of a computer mouse, owners and operators can obtain data about occupancy levels, and those real-time occupancy numbers can be broken down for particular floors of a garage, and even particular sections of a given floor. It’s easy to see how real-time information is more useful than measuring occupancy on a given day and then making assumptions about how those numbers translate to other days or times of the year. PGS can also tell owners when parking facilities tend to be full or empty. This can be broken down by day (what times during the day are busiest), weeks (which days during the week are busiest), or even months (is the garage busiest during certain times of the year?). This is essential data for making future capital investment decisions, and it’s always 100% accurate. Similarly, many cities stipulate parking minimums when owners expand or developers build new properties. In the past, the only recourse for owners and developers was to turn to parking consultants to conduct parking utilization studies and write reports demonstrating that the extra parking isn’t really needed—at the cost of tens of thousands of dollars. However, today, with parking guidance technology, that data can be obtained in a moment with just the click of a mouse, and at no additional cost. The data collected by parking guidance technology can be just as useful in the day-to-day operations of parking facilities. The real-time information provided by PGS can be used for a number of management purposes. For instance, utilization data can be used to manage dynamic—or market-based—pricing, raising hourly rates when occupancy rises and dropping them when it falls. Or it can be used in the allocation of different types of parking, changing the designation of individual spaces from general to other uses such as handicap accessible, valet, or premium parking as demand for each type of space rises and falls. PGS can also provide some certainty for the future. Experts predict that the advent of self-driving (or autonomous) vehicles will ultimately reduce parking demand by 42 percent. But the changes wrought by self-driving cars won’t happen overnight. As the technology is perfected and gradually adopted by ride share operators, private vehicles owners, and others, parking demand will likewise gradually evolve. By using parking guidance technology to constantly measure parking demand, parking owners will be able to keep on top of the changes resulting from the adoption of autonomous vehicles and make informed decisions about how best to allocate their parking resources. Perhaps this will mean offering more specialized parking spaces for premium parkers, people with disabilities, or other types of parkers. Or perhaps it will mean converting some parking spaces to other uses. Ultimately, the accurate, real-time data collected by an owner’s parking guidance system will provide the information owners need to make planning decisions that meet their unique needs. Contact us for more information, or find out how we can help improve your parking experience. 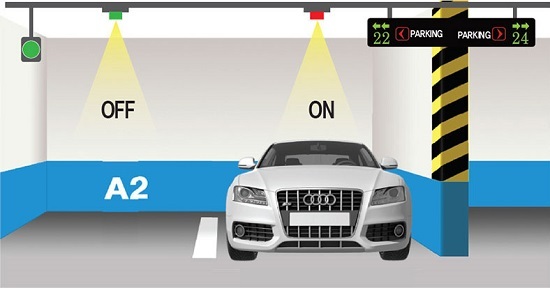 Parking guidance technology will continue to be attractive to parking owners because of the extraordinary customer convenience it provides, not to mention the resultant marketing benefits of offering more convenient parking. But for owners, PGS offers so much more. If you’re not using your PGS system to make better capital planning and day-to-day management decisions, you aren’t getting all you should from the technology.